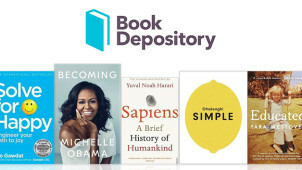 Book Depository is a site dedicated to bringing you the titles you love. Whether you’re after a crime thriller you just can’t get away from, the latest life-changing Booker Prize winner to a graphic novel opening your mind to a whole new world, Book Depository has something you’ll love. From favourites you return to again and again like Harry Potter, Sherlock Holmes and the works of Stephen King to just-discovered gems that’ll soon have everyone talking, you’ve got everything you need here to get your bookish fix. Sort the kids out with birthday presents for years to come from the children’s section, find a modern classic to chew on for your next book club or even try some non-fiction to learn something new! There’s nothing you can’t find on the Book Depository website — with 18 million titles and counting, you’ll be able to spend hours browsing its selection. If you want to cut straight to a great read, why not browse its lists and categories like Best Ever Books, Books on Screen or the Bargain Shop to take you directly to your new favourite title. Your discount code will be automatically applied with savings indicated in red! Sign up to Book Depository’s email newsletter to hear about some brilliant offers! Can I get free delivery with Book Depository? Yes, Book Depository offers free worldwide delivery! Does Book Depository have a sale section? Yes, head to its Bargain Shop to get some great deals! What payment methods does Book Depository accept? You’ll be able to pay with Mastercard, AmEx, Visa or PayPal! Delivery is free and takes 4-6 working days! You can cancel your Book Depository purchase within 30 days of receipt to receive an exchange or refund. Contact Book Depository to initiate your return. Once you’ve contacted the Book Depository, you must return the item within 14 days, from which point you’ll be refunded within another 14 days. Books are good for the soul — sometimes there’s nothing better than turning off the TV and curling up on the settee with a gripping thriller, tragic romance or laugh-out-loud adventure. Order your next title with a Book Depository discount code from vouchercloud and you’ll be making a saving on your next sofa companion. With millions of crime novels, fantasy epics and children’s books to choose from, everyone in the house will find something to read at Book Depository. The book is a lot older than you might think. Although German inventor Johannes Gutenberg invented the movable type printing press in 1440, Chinese inventor Bi Sheng had assembled one from porcelain as far back as 1040 and 13th century Korea brought about the first metal system. These machines were labour intensive and didn’t catch on, but they do show just how long humans have been fascinated with books! Michael Jackson once sang “If you want to make the world a better place, take a look at yourself and make a change”. Now you can take Michael’s wise words to heart with the self-help books available from Book Depository that bring you the wisdom of countless writers, therapists, thinkers and even the Dalai Lama. Order yours with a Book Depository voucher from vouchercloud to make sure you save money and you’ll be walking the path to a sound mind for less.